. I jumped at the chance, mainly because I’m a vintage junkie. Also, I love the timeless quality of sewing and the inspiration found in vintage patterns, pictures, etc. I’d seen the beautiful cover of Vintage Notions, but I’d never had the chance to really sit down with the book. It was right up my alley. It’s not necessarily a pattern book (although there is a great collection of vintage patterns with diagrams included in the book), but more of an “inspirational guide to Needlework, Cooking, Sewing, Fashion and Fun” featuring gorgeous images of vintage illustrations, textiles, and, of course, notions. If you find your mind working overtime, pick up a magazine and read a story that has a wholesome bit of humor or pathos, the entertaining sort that is light but agreeable reading. I think there are some pretty timeless aspects of the domestic arts – they’re still like comfort food. And it was a lot of fun to read about how it was done in the early 20th Century. I plan to keep this book by my bed for the weeks to come, enjoying the other tips and tidbits Amy Barickman and Mary Brooks Picken have to offer. Amy is also designs wonderful pattern, distributed through her pattern company, Indygo Junction. And there’s something for everyone – whether you’re a vintage junkie too, or your tastes are a little more modern. 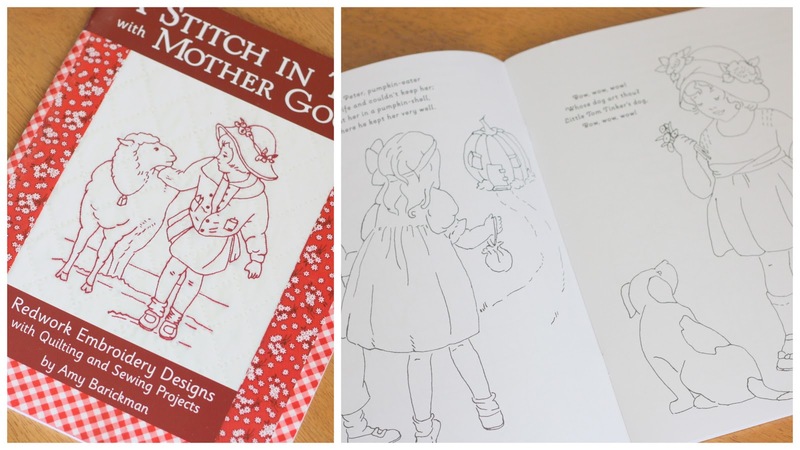 Above is a book of vintage embroidery patterns called A Stitch in Time with Mother Goose. The book contains over 25 vintage nursery rhyme embroidery designs and baby quilt and bib patterns. And for those of you who are a little more modern in your tastes, there are lots of fabulous options including this great apron pattern, a fabulous applique bag pattern, and two patterns to make trendy zipper and wool roving accessories. Congratulations Ladies. Thanks so much to everyone who stopped by. Glad to know I’m not the only one who happily straddles the vintage/modern divide. I&#39;m definitely a both kinda gal!<br />Really, how could one choose between Vintage or Modern? <br />&amp; I&#39;m loving the corsage! <br /><br />-Many Smiles! I&#39;m totally vintage. I try to go modern in fabric and patterns, but I keep returning to the vintage look. I&#39;ve always been vintage but I&#39;m experimenting with modern lately so I guess it&#39;s BOTH! I love both also. Thanks for the giveaway! Hard to choose…. I might have to go with both as well!! I&#39;m drawn to the modern…Thanks for the chance! I am definitely both – modern and vintage!! I would have to say &quot;both&quot;! Thanks for the chance! Both! Love that zipper brooch. Thanks for a fun giveaway. Both! But probably a little more modern than vintage. I would have to say Both. I&#39;m with you, depends on the mood. Your corsage came out beautifully! I&#39;m more of a modern with a vintage twist kind of girl.. does that make any sense?! Great contest! I think I&#39;d say modern, but I&#39;m loving those redwork designs. Thanks for the chance! ill throw my hat in the ring for the 4 patterns. thanks so much…ive had this book from the library and found it very interesting! I&#39;m both to the extreme. The whole middle part isn&#39;t interesting to me at all. I guess it&#39;s because it&#39;s my grandmama and my mother&#39;s gig. It makes my life easy at the fabric stores these days since we both find something we like. I currently have 70 plus vintage aprons hanging at our local museum, so vintage would seem to be my answer. But, I am upcycling men&#39;s shirts into aprons, so that would say modern. <br />So I guess I&#39;ll have to say BOTH!!! vintage — always vintage…because antiques, old things (and people) have stability, they are strong and have endured the test of time. there is much we can learn from them. what will &#39;modern&#39; have to say in 100 years? it will be considered &#39;vintage&#39; by then! and, so it continues! I also love both but in this situation, I would love to try those modern patterns. Both for me! The book review was very good~ Looks like one I will enjoy purchasing! Like most, I would have to say both. Vintage reminds me of being in my great-grandma&#39;s farmhouse, but the modern, who can pass it by? Can&#39;t I have both? Well, if I have to choose, I&#39;d say modern. Thank you kindly! I would consider myself much more vintage in my choices for sewing and fabric. Modern! Love your blog… love… love! I prefer modern quilting but vintage clothing! I adore Indygo Junction patterns, their women&#39;s patterns are one of the few that I can wear with minimal alterations. I&#39;m vintage and modern…but after seeing that adorable zipper corsage I have to go with modern this time! Lately, I&#39;ve been leaning more towards the MODERN. Count me in! I would have to say both. I like modern, but I like modern that is inspired by vintage. Does that make sense? vintage!! !<br />althought I can&#39;t put modern away! !<br />I really became curious about this book! I&#39;m vintage! Modern often catches my eye yet my heart prefers vintage. Happy quilting! I&#39;ve never left a comment on a blog before. I just found yours and I like it! I like both but think I would love the Vintage!Guess I cannot enter the contest because I do not have any of these accts. So hard to decide, modern – please. It would be both for me too! VINTAGE! jenny and sullivan and parker at comcast dot net. I would say both but I sure do love vintage ! I love vintage! I&#39;ve been looking around for some vintage nursery patterns to make something for my niece. What a fun set of reviews. I think that I prefer modern, but I might be limiting myself because I love the look of the appliquéd bag! Both! Love both! So fun and thanks for the giveaway! both! love the applique bag, but also adore the old style kid stuff! I am definitely Vintage and this book is right up my alley. I love to read about things like this and collect vintage books like this. I have added this to my must have list. Thanks for the review. Great book review, Amy! I used to love reading my grandmother&#39;s old books – they looked a lot like the pages you&#39;ve shown! And I&#39;d definitely have to say BOTH to the giveaway – they both look wonderful! I am definitely a both. I&#39;m a both kinda of girl for sure! I use to be all about vintage but in the last few months I have really been leaning to modern so I guess I would have to say both. Thanks for the giveaway. Both 🙂 Thanks for the giveaway! I&#39;d say I&#39;m a vintage – love the retro look. Some beautiful embroidery in this book from the peeks you&#39;ve given! Since my father is in the antique business, I have grown up with a love vintage stuff! Those Mother Goose patterns are so cute!!! Both! Thanks Amy! Isn&#39;t it great that you were able to review the book. Good for you! I am modern all the way! I love a bit of both. I love how vintage has become modern nowadays. I am modern and thank you for the chance to win! what a great giveaways you have, lovely! I like it both but because i have no more little children, i prefer giveaway 2 more! Thanks for giving us this change to win! Inner tendance – Vintage, but moving toward modern as I see the beautiful modern things people are doing. LOVE the mother goose book. It is right up my alley since I have been looking for cute mother goose inspired embroidery patterns! Oh how I hope I can win this! I guess I am a little of both. Of course, if I had to choose for the giveaway it would be modern. I love your review since I have never heard of Indygo Junction. I will definitely be checking them out. Thank you. What a great giveaway! I&#39;m going to pick up Vintage Notions just for the eye candy! Hmm.. vintage or modern? I guess it depends on my mood. Mostly modern with a few fabulous vintage accents thrown in here and there! Love Indygo Junction! I&#39;d have to say both vintage and modern…Looks like a great book! I love the vintage embroidery patterns! So sweet. Used to be a modern kinda girl but am starting to become a little more vintage! I love vintage and learning about it. I love modern also, my home is modern. Vintage, mostly because I was just searching the other day for some nursery rhyme patterns. And looky, there they are! Vintage – Mother Goose seems fitting for a new baby quilt that must finish before June (after taxes are done). Thanks to you and Indygo J. for this giveaway. I like both, but think I like the vintage of these offers. Or maybe the modern??? Oh I don&#39;t know. You pick for me. Thanks. I think today I&#39;m vintage! My taste changes day to day and today I&#39;ve been looking at Redwork, so vintage it is! Great review. I&#39;m thinking modern. I like the idea of vintage but keep seeing myself go modern! I love Indygo Junction patterns – I&#39;ve used the Gored Skirt and Wrap Skirt and loved them. That Petal Blossom Bag looks great! I&#39;m half-n-half! LOVE vintage. LOVE modern. It all depends who or what I&#39;m making it for. I would love to have either giveaway-your choice! Love your blog! Vintage for me. It brings me back to living simply. I think I generally prefer vintage. 🙂 Thanks for the giveaway and review. I love both of theses styles and would be happy with either. Thanks for the chance to win!!! I love both – making a quilt of all 30s right now with a solid block Malka on the cutting board for the next one …too many choices ! At first I wanted to say vintage…but I&#39;m leaning toward Modern..it must be spring in the air!! Modern for me. Totally modern. Both for sure! I love the self portrait! Both for me, I go back and forth. Thanks for the chance to win. I have to admit that I am more of a modern type person… although I do like looking at the vintage type things. Both!! My tastes are definitely at both ends of the spectrum! I think vintage is soooo pretty, but when it comes to making stuff myself, I find modern comes a lot easier. I am the &quot;both&quot; kinda girl! And thanks for the lovely giveaway! OH, I love vintage AND modern. It depends on what it is, and what the purpose is for.<br /><br />Thank you for your comment on my blog! I&#39;m a vintage sort of person.<br />Thanks for a great giveaway! Hello from Tiziana! I think I&#39;ll choose vintage! Thanks for the post…and the chance. Both! But I have a serious weakness for vintage. It would be so fun to win, since this giveaway closes on my bday. Thanks for the chance to win! a bit more on the vintage side. Definitely a both kind of girl…although the Mother Goose embroidery sounds so sweet. I need to get my hands on the book–it looks like a great book to curl up with and spend lots of time looking through. Modern!<br /><br />I love vintage, but from afar, my real life is modern. That book looks so interesting. Thanks for the review.<br /><br />I&#39;m definitely split between modern and vintage. Those vintage patterns are too cute, but I also love fresh, modern ideas. Love that messenger bag. You&#39;re right, it&#39;s so hard to choose just one!